Have you ever had something that you knew needed to be done, but you were super anxious about it and kept putting it off, only to reach that point where you knew it was now or never? Well, this is how I have felt about switching Kinsley to a toddler bed (or twin mattress on the floor in our case). Maybe I dreaded it because I have a friend who just switched their child and it has been a nightmare for them to get her to stay in the bed and the room. Maybe I dreaded it because I know Kinsley and how she loves to move, move, move and knew that she would have a hard time just laying in bed waiting to go to sleep. Maybe its because I knew this would dramatically affect our traveling in the sense that we wouldn’t be able to just throw a pack-n-play down wherever we are, but we would have to think about making a palette on the floor or having a bed for her to sleep in (accompanied with rails of course). Whatever the reason for my anxiety, I reached the peak last week where I pretty much decided it was now or never (ok, not never because what child goes to college in a crib?). We knew we had a few weeks before our traveling began so we could either bite the bullet and start it NOW, or wait until what could possibly be August. I felt like this thing had been hanging over my head forever that I just needed to DO IT. So do it we did. We took her to the store to help us pick it out (of course she had no idea what we were doing but she enjoyed running around the store and I realized a mattress store is the best place for a toddler because there is nothing to break, pull out, run over, etc.) Then we took her to Target to pick out a cute sheet set, a pillow, mattress pad, etc. So, the next night, it began….. Despite all my concerns, it has gone really well. Yes, she still cries a few minutes before passing out. 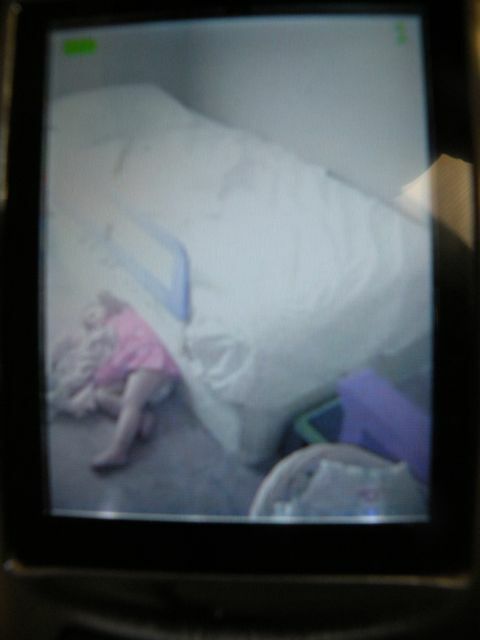 Yes, she has slept most days on the floor for her nap (she can climb back in it but for some reason has landed on the floor everyday as evidenced by this picture taken from our monitor) but I don’t care where she sleeps as long as she sleeps. Yes, she feel asleep last night on the floor and we had to move her to her bed. But I figure one day, she will realize the bed is for sleeping, not the floor, and that the bed is way more comfortable. Until that day, the floor will be for…sleeping. In other news, I was invited to be a part of a Bible study with women from our church who have children who are at home during the day. This was such an answer to prayer and a huge blessing! We are a part of a small group but most of the families have middle-school aged children so I was missing being in fellowship with more moms of my life stage and studying the Word with them. We are reading through the book “Feminine Appeal” by Carolyn Maheney. It has been great so far! Today’s study was on self-control. Whoa buddy, what an eye-opener to how much I lack of it. But as she points out “If Scripture requires self-control from every Christian (Titus 2), it is obviously attainable by every Christian (with the help of the Holy Spirit).” I look forward to seeing how the Lord uses this lesson to affect my thoughts, behaviors, attitudes, actions, etc. and uses it to grow me more into his likeness. 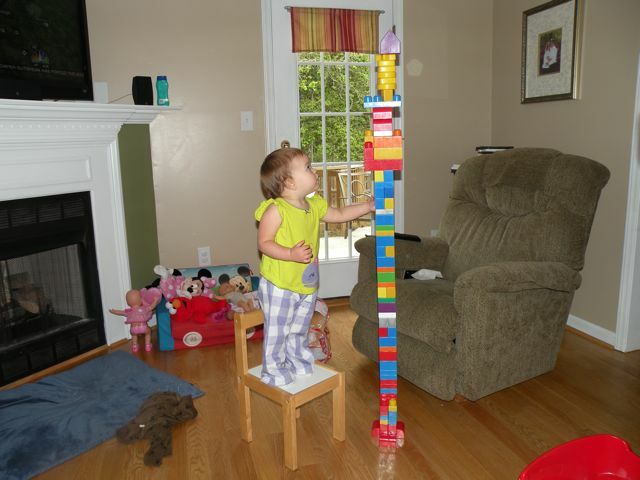 Here is a random, fun picture of Kinsley putting together (with Dad’s help, of course) her tallest tower of blocks. These blocks are her new favorite fun thing to play with, but boy, do they get everywhere! !